"Just because you are miserable doesn't mean you can't have fun." "Laz" is one of our running friends who has a way with words. 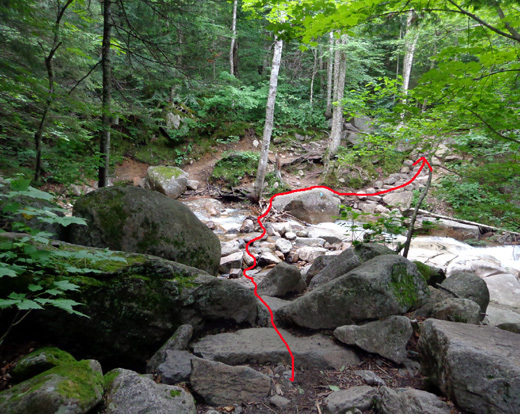 Although he wrote the above comment in a post about racing to the online ultra running forum back in January, I thought about it today when I was clawing my way up a very rough section of the Waterfall Trail on my way to Franconia Ridge -- and sliding down slick bedrock on the Old Bridle Path descent. I wasn't in a race or in a hurry walking but I could relate to the comment -- even though the rough trails weren't kind to my aging joints, I still love to explore places that are new to me. It's fun. 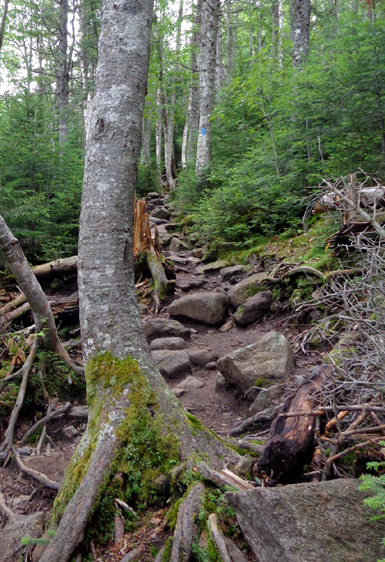 The Waterfall Trail is a sub-alpine jungle of roots and rocks. 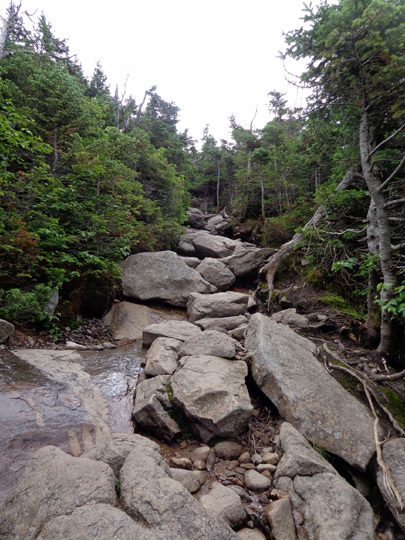 I also love going back to some of my favorite sections of the Appalachian Trail from my Adventure Run in 2005. 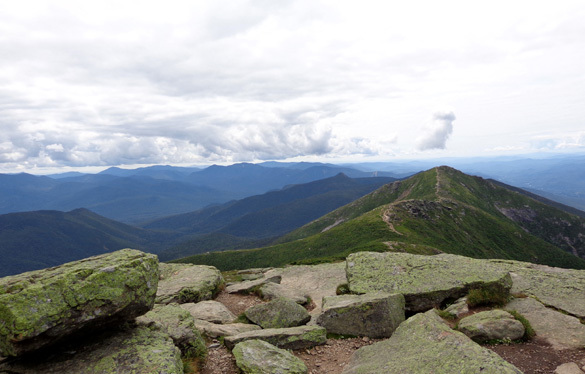 Franconia Ridge was in my Top Five and I've been wanting to go back ever since. 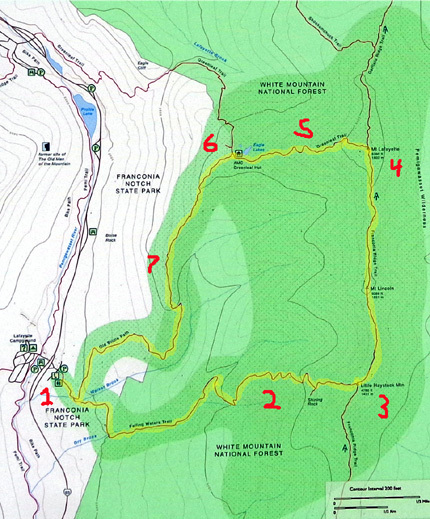 Even back then, though, I wasn't able to do the entire ridgeline from Franconia Notch to Crawford Notch in one day. I spent the night of Day 118 at Galehead Hut, the only night I wasn't in our camper overnight during that entire trek from Georgia to Maine. 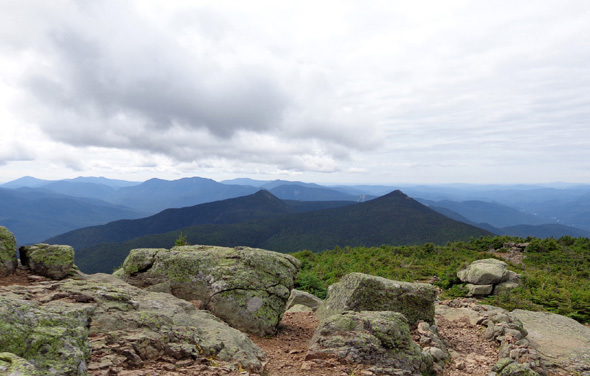 View south from the summit of Little Haystack Mountain; I hiked north on the ridge. Today I knew I'd have to use one or more of the shorter side trails that access the ridge and either do a loop or an out-and-back hike. Poring over the topo maps Eric loaned us, I chose to do a nine-mile loop incorporating the Falling Waters, Greenleaf, and Old Bridle Path trails. Eric suggested I do it clockwise. When I saw that the elevation profile was steeper on the shorter Falling Waters Trail, I decided to go counter-clockwise. I can climb up steep trails more easily than I can descend them (those doggone Granny Knees!). In retrospect, I think going CCW was the better choice for me. 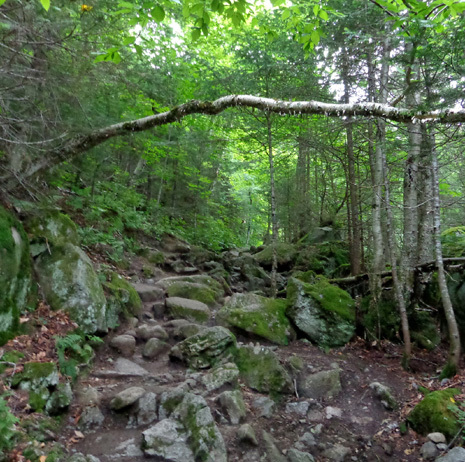 The descent was difficult on the Old Bridle Path but I know it would have been even more tedious and treacherous for me on the Falling Waters Trail, especially when I was more tired in the last third of my hike. In addition, on Falling Waters I could see all the waterfalls and cascades better going uphill than I could have going downhill. 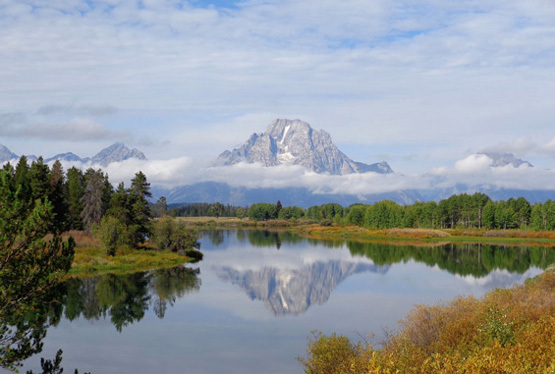 In this multi-page entry I'll describe my nine-mile hike, which took me about nine hours because of three leisurely snack breaks and stopping numerous times to take over 400 photos. I tried to go slowly enough to enjoy the scenery, as well as to protect my knees as much as possible. 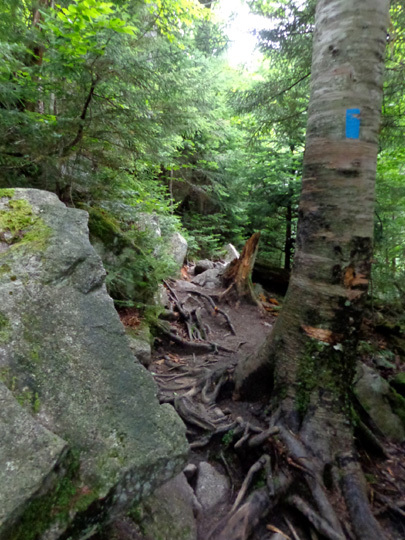 When am I going to learn that virtually no trail in the White Mountains is "easy," especially now that I'm not trained as well as I was when I ran and hiked the Appalachian Trail nine years ago -- and my knees have aged much more than that??? This was a pretty day that started earlier than usual for me. I got up about 5:30 AM when I saw that it was already light outside. I checked the NOAA site before getting ready to go. Overnight, the weather prediction for Twin Mountain deteriorated -- a 40% chance of rain after noon, not 30% after 2 PM. Uh, oh! summit of Mt. Lafayette, enjoying my lunch and looking north in this photo. 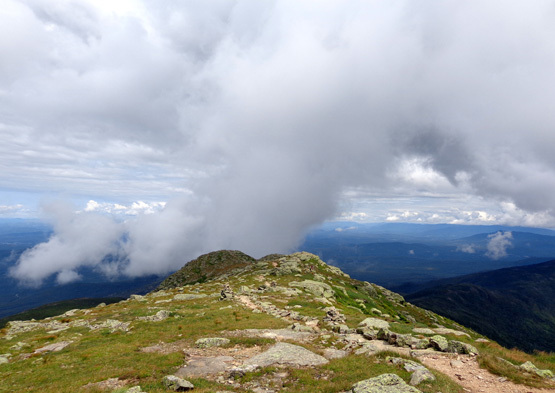 I knew the chance for rain was probably higher on Franconia Ridge than down in the valley, so I got going as quickly as I could. 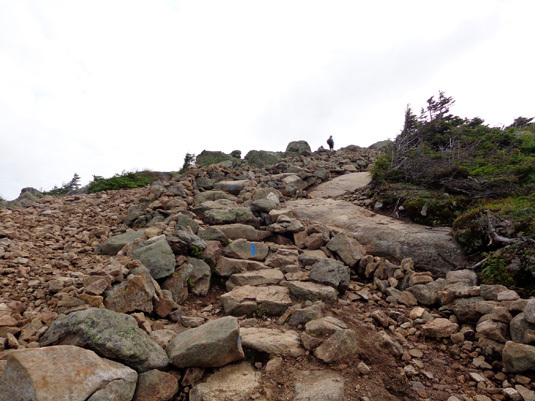 Over three miles of this loop are above treeline. By starting my hike about 7 AM I was able to get up to the ridge by 10 AM and down to treeline at the Greenleaf Hut by 1 PM. Fortunately, the weather was good on the ridge all day -- some clouds in the morning but mostly sunny all afternoon. 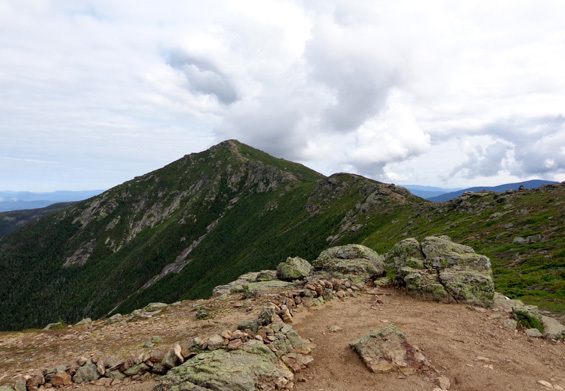 It was just as nice on the ridge as it was when I was there nine years ago, with fewer clouds blowing over the peaks of Little Haystack, Lincoln, and Lafayette. 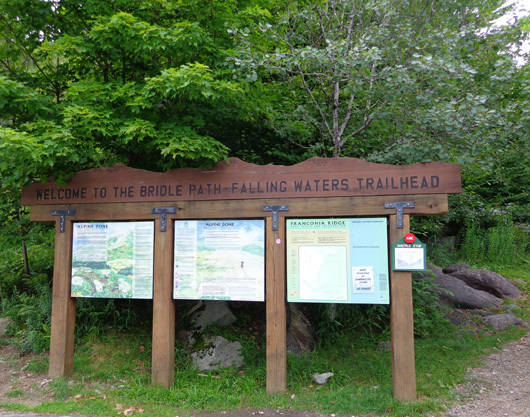 There were very few vehicles in the Old Bridle Path-Falling Waters trailhead parking area when I arrived just before 7 AM, much different from the scene on Saturday when cars were parked out along I-93, an interstate "parkway" with a 45 MPH speed limit through Franconia Notch. Near the trailhead a large group of teenagers was waiting to begin the same CCW loop hike I was doing. I like peace and quiet when I hike, so when I heard their plan I moved along and managed to stay ahead of them until 1/4 mile from the end. Plenty of 20- and 30-somethings passed me all day, however. I saw only one person who looked older than me on these trails today. 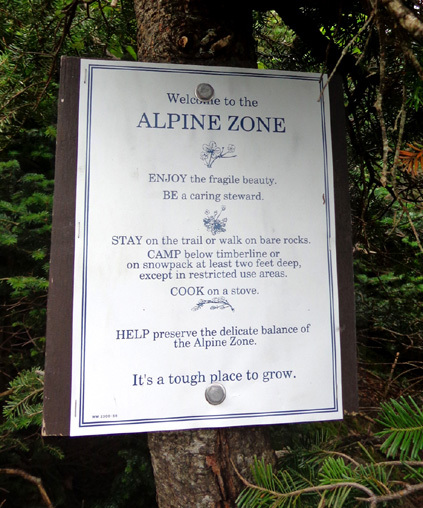 I was a bit surprised there were so many folks on the trails for a weekday, but it is the height of summer and this is a popular hike despite the gnarly trails. 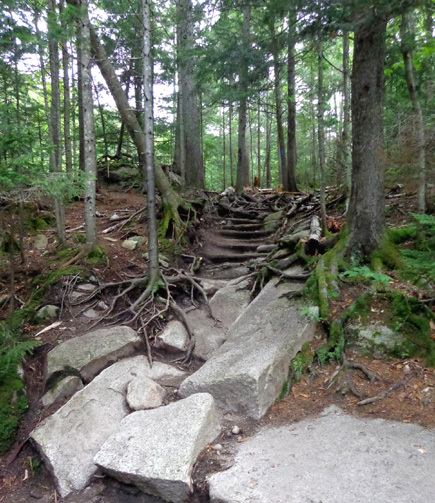 The first couple miles of this trail are interesting but gnarly. There were a bunch of stream crossings and I was in knee-deep water two or three times. With two trekking poles, I didn't slip on any slick rocks or fear any of the water crossings. The water levels are pretty low right now. 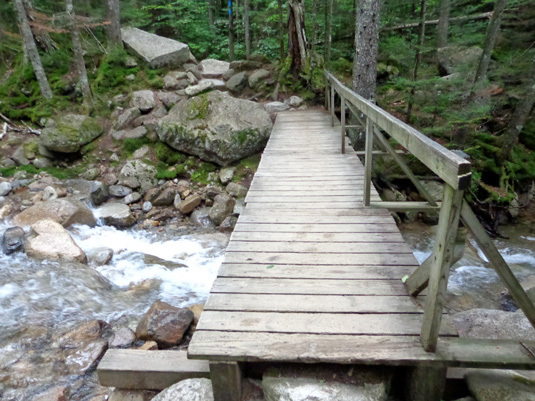 After a hard rain, during the spring thaw, or in icy conditions this trail could be downright dangerous. This trail begins at the Lafayette Place parking lots . 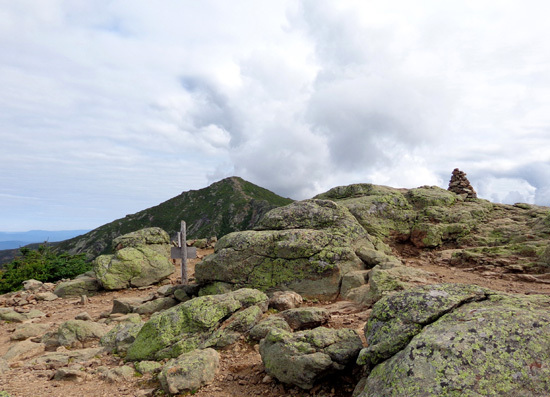 . . and climbs to Franconia Ridge Trail at the summit of Little Haystack Mountain, passing several waterfalls in its lower part. 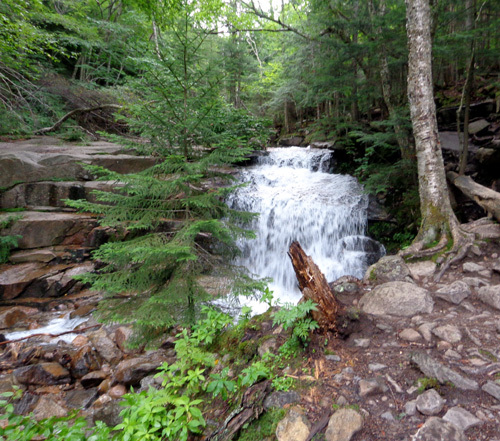 Falling Waters Trail is steep and rough in parts and better for ascent than descent, but not normally dangerous . . .
. . . At 0.2 mi., the trail turns sharply right from Old Bridle Path and immediately crosses Walker Brook on a bridge . . .
And that's the only bridge I saw on this loop! At 0.7 mi. . . . 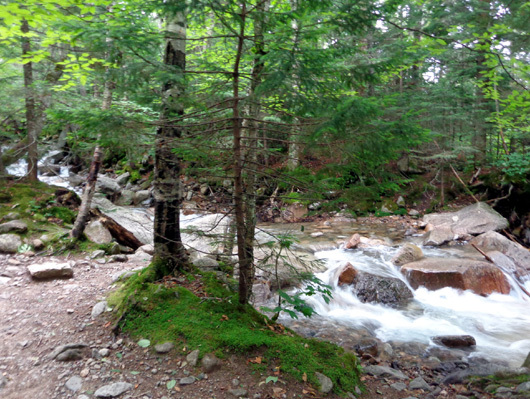 Falling Waters Trail crosses Dry Brook (use caution if the water is high) . . . and follows the south bank up to a beautiful cascade known as Stairs Falls. I'd been hiking for about an hour (only 1.25 miles) when the first two hikers passed me. Until then I wondered if I was the only one on the trail. I liked the solitude but was a little concerned that if I got into trouble, there wouldn't be anyone around to help. No problem -- the young men said there were "a bunch" of hikers behind me. Another ten passed me before I reached the ridge, and there were more behind them. 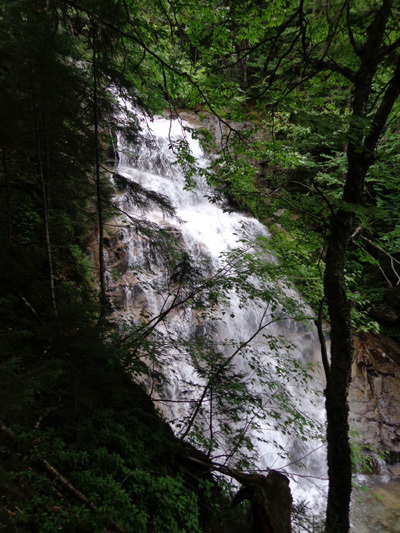 The trail leaves the old road at a steep embankment and ascends more roughly to the foot of Cloudland Falls (80 ft. high) at 1.3 mi. 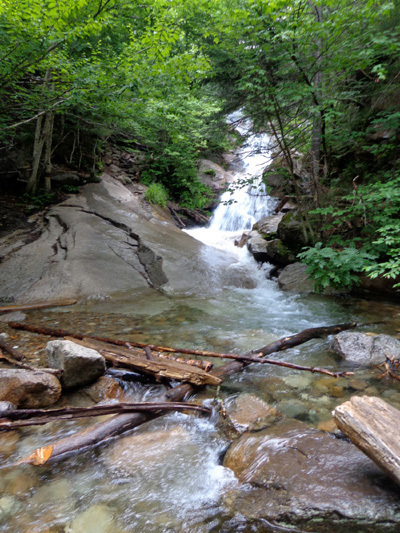 The trail then climbs steeply up the bank of the brook beside the fall, with a dropoff to the right . . . Recently cut rock steps aid in a ledgy scramble to the top of the falls . 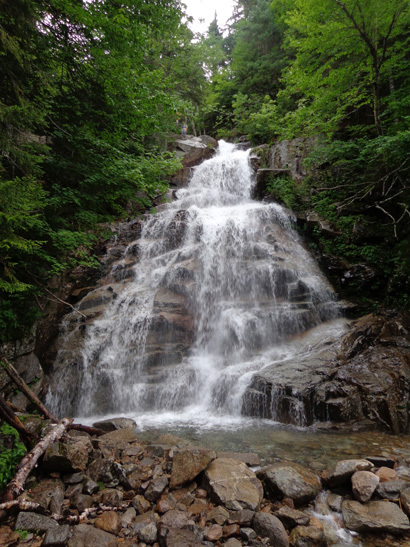 . .
At the head of Cloudland Falls are two small (25 ft.) falls practically facing each other . 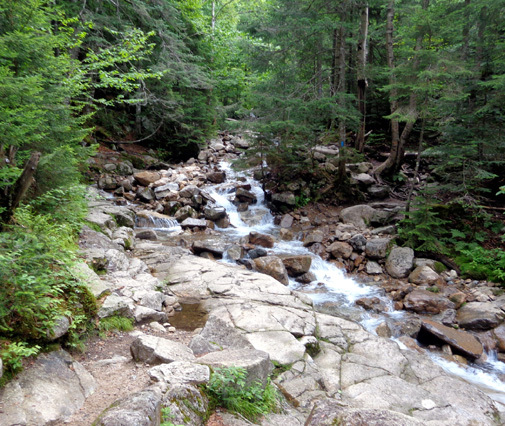 . . [one is a branch of Dry Brook that runs down from Little Haystack Mtn., the other from Mt. Lincoln]. The trail continues steeply on the north bank of the Mt. Lincoln branch, soon crosses to the south bank, crosses back to the north side, climbs to and follows an old logging road [again, I couldn't recognize that this was ever a roadway], and recrosses to the south bank at 1.6 mi. 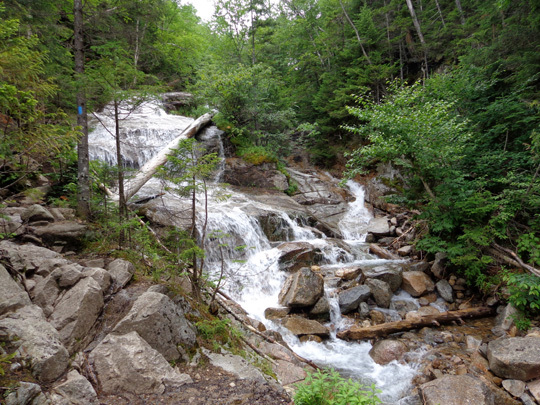 After this, the trail swings away from the stream and switchbacks the rest of the way up to the ridge. 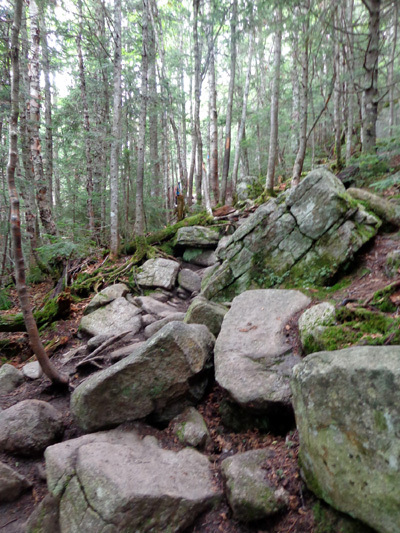 The trail continues to be very rocky and rooty and my pace continued to be very slow. 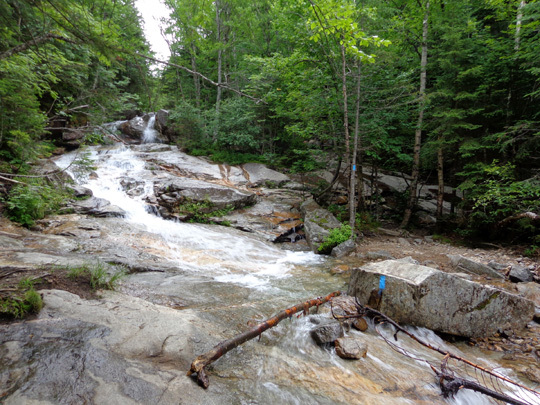 Five trail workers were installing new rock and log water breaks in four areas between the last stream and the ridge. I stopped to thank each of them. Jim and I have done work on the Appalachian Trail and we know that it's a hard job. but smiling when I remembered Laz's quote at the top of this page! 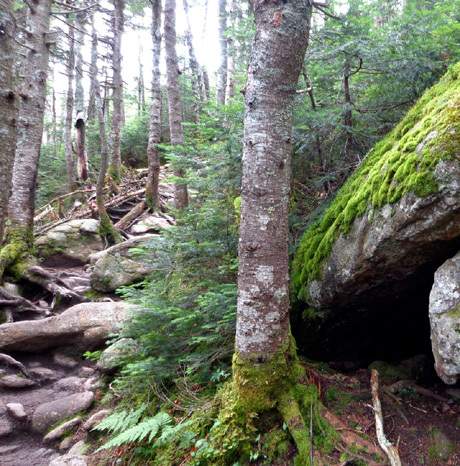 Soon after the junction with the Shining Rock Trail spur three miles into my hike, the Falling Waters Trail finally pops out of the woods and onto the open 4,780' peak of Little Haystack Mountain. 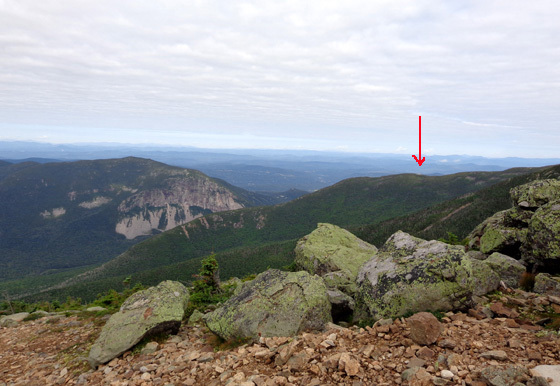 I had about three more miles of hiking to reach Greenleaf Hut, under the red arrow. I was hoping to get there in two hours but it took me closer to three hours to go the first 3.2 miles. I was happy to reach the ridge and finally see some sunshine. The clouds were mostly white, not looking at all like rain, and there was only a little breeze. It was perfect, and I loved the 360-degree views. Made it to the summit of Little Haystack! Lafayette's peak is in the distance, just under two miles on foot. As soon as I got up there I realized the difficult hike up was worth it and I tried to forget how hard it was probably going to be to descend in another couple hours.